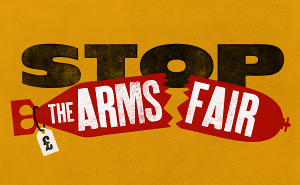 GIG Vs. ARMS FAIR! Stop Arming Israel! This September, London is hosting one of the world’s biggest arms fairs, DSEI. We need your help to shut it down before it starts. We’ve got a fun, packed programme to keep you engaged throughout the day. We’ll have a welcome tent, a kids space and a portaloo – you can come for the whole day or just pop in! We’re meeting in a green space near the Excel Centre. Join and share the event on Facebook.